The Climategate story just got bigger – from Rionovosta, via the Ria Novosti agency, posted on Icecap and sent to us from the CEI in Washington (ain't the internet wonderful!). It explains how the Met Office Hadley Centre appears to have been cherry-picking Russian temperature data, to pick the stations which show the warmer temperatures ... a variation on "hide the decline". James Delingpole is running with it ... and here, plus Big Government has an interesting piece. Now also done by WUWT. The original paper is here (in Russian), with a rough machine translation here. Steve McIntyre also blogs it, linking it with the CRU e-mails showing that Phil Jones, acting as a reviewer of the CRU data used in the HadCRUT gridded temperature, "went to town” to block the publication of criticisms of his handling of Russian data." Unusually for us, the article is posted in full (our emphasis) below. The graph above is a temperature plot using some of the data not used by Hadley; it shows the absence of a warming trend. 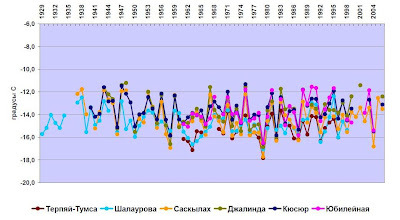 Icecap notes: recall it is in Soviet Union that the CRU, NOAA, NASA show the greatest warming. As this story implies, there was no obvious reason for these data centres to be selective about stations. It implies the stations often selected were urban and those with incomplete data, providing more opportunity for mischief. This, as they say, is SERIAL!